Lexus unveiled the all-new RC Coupe at the 2013 Tokyo Motor Show this week which offers another example of the renewed Lexus focus on design. The RC is a stand-alone model rather than a two-door derivative of a sedan and it will be available as a 2014 model. This boldly styled coupe offers the most aggressive use yet of the signature spindle front grille that highlights the new Lexus design direction, offering a departure from the more reserved and understated Lexus designs of the past. 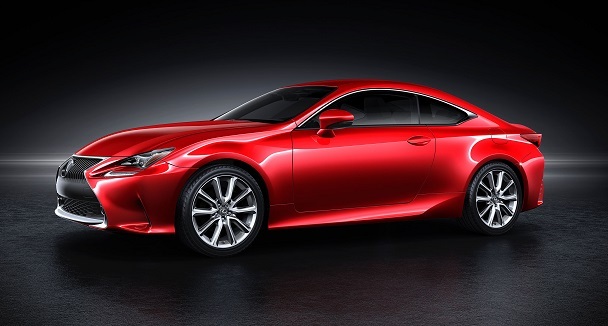 The RC Coupe represents the widest and lowest application yet of the Lexus spindle grille, and the vehicle is 1.2-inches wider, 1.4-inches lower and 2.8-inches shorter in wheelbase than the new IS sedan, providing a very aggressive road stance that’s ideal for a coupe. There are also two choices of aluminum wheels – a deeply sculpted 10-spoke 19-inch and a muscular five-spoke 18-inch. Lexus is building on the design achievements of recent models, particularly the new IS Sedan. From the photos we can see that the interior looks impressive as well, with maximum use of contrasting colors, materials and lighting. I’ve driven the entire Lexus lineup, including all of the F Sport models, and I’m looking forward to driving this one as well. The performance and handling of the Lexus lineup has improved dramatically as the emphasis on performance has matched the emphasis on bolder designs. I fully expect this new RC Coupe to live up to those standards. The vehicle features a dual injection 3.5-liter V6 gas engine that produces maximum power of 314 hp at 6,400 rpm, and peak torque of 280 lb.-ft. at 4,800 rpm. It also comes with a hybrid variant uses a dual-injected 2.5-liter four cylinder engine with a 105kW electric motor driven through an electronic continuously variable transmission with six step gears in a sequential shift-matic feature. An eight-speed Sport Direct Shift with paddle shift transmission adapted from the impressive ISF performance sedan optimizes power delivery and fuel economy. RC uses double wishbone front suspension and multi-link suspension at the rear. Lexus notes that a new red exterior paint color is made brighter and shows more contrast thanks to a new painting process. It looks great in the photos, and I’m looking forward to seeing it and then driving it!